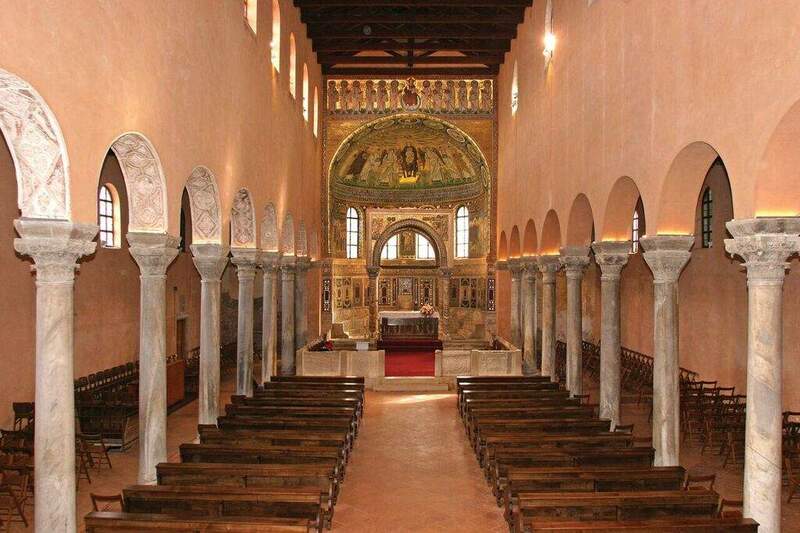 Built during the time of Bishop Euphrasius in the 6th century it includes atrium, baptistery, bishop's palace, mosaics and remains of sacral buildings dating from the 3rd to the 4th centuries. The mosaics which decorate the inside and facade of the church are considered a valuable bequest of Byzantine art, and thanks to the floor mosaics and preserved writings the periods of its construction and renovation can be read. In the long history of the city of Poreč, one relatively short period of time was to change its destiny for ever. The small provincial town on the margins of the moribund Roman Empire went through a remarkable transformation in the 6th century. Attempting at this time to pull the disunited empire together, Emperor Justinian created for a short space the illusion of the one-time whole. But not only a territorial and political whole. He also attempted to bring back the brilliance of the art of the ancient world. During the full flowering of Justinian’s reconquista, Euphrasius, Bishop of Poreč, had a cathedral built on the site of the older city basilica, harmonising it with a series of accompanying buildings that were together to create one of the great architectural complexes of the time. Here, on the northern edge of a peninsula on which a few centuries earlier the model Roman city of Parentium had been built, the taste, the brilliance and the stylistic richness of the East were to develop into a new whole that would be a genuine mark of the time. The taste of Bishop Euphrasius, moulded on the luxury of the east, could never have been satisfied with the state of provincial lethargy that marked Poreč, Istria and most of the tottering Roman Empire. Undertaking his great architectural enterprises, he was only in part to assimilate his ambitious ideas with the ancient base that he found there, and to a major extent was to bring in architectural and artistic innovations the like of which the West was still unfamiliar with. These innovations relate to the organisation of space in the Basilica, especially in the eastern part of it, as well as the iconographic programme that the bishop, with the help of the superb artisans that he brought with him, was to show in the mosaics that cover the walls of the interior. The great Porečian bishop subordinated the church in its entirety to himself. He had his own initials inscribed in many of the prominent places, and in the mosaics of the apse he found his way into the space meant exclusively for the saints and the martyrs, and the very Virgin and Christ, showing in a very unambivalent way the place he saw himself in. This gesture, more authoritative than narcissistic, conceals a number of messages, including that of the bishop’s relationship with the Pope, who had anathematised and excommunicated him. Indeed, Euphrasius’s time, which even today shines out so clearly and legibly from his Basilica and the complex to which it belongs, took the little Istrian town of Poreč out of its insipid if charming context of the commonplace, placing it in the grandly individual. Arriving in Poreč in the middle of the 6th century, Euphrasius found here a city with a long past. The visible layer corresponds completely in its characteristics to the typical provincial town of the later classical period, eroded by the distresses of time, literally meaning the hordes of barbarians which had recently put an end to a rich tradition. It is true that the distance factor would, as far as Poreč, Istria and other peripheral zones were concerned, soften the blow of the barbarian incursions as felt in the mother country. Here, Rome died with a temporal lapse. Taking over the see of Poreč, Euphrasius arrived at the head of a well-organised Christian community that in its long tradition had given the church several martyred saints, among whom was Saint Eleutherius, and, particularly, the important Saint Maurus, a bishop who at the time of the great persecutions was executed in Poreč together with his clergy and numbers of the laity. However, the gap between the last persecutions of the Christians at the beginning of the 4th century and the mid-6th century when Poreč and Bishop Euphrasius came into full flower was filled with a constant augmentation of the power of the church. This status of the church is corroborated by the numerous sacred buildings that sprang up all round Istria, the basilicas of Poreč being particularly important. The second half of the 5th century was marked by the barbarian attacks on Rome itself and other key points of the Empire. Alaric, the Huns under Attila, Odacer, who became king of Italy in 476, replaced in 493 by Theodoric, all to some extent left Istria out of it in the violent transformations from without. At the end of the 5th century, Istria was part of Theodoric’s Ostrogothic state, but in the age of Justinian, in 539, it became part of the Byzantine or Eastern part of the Roman Empire. 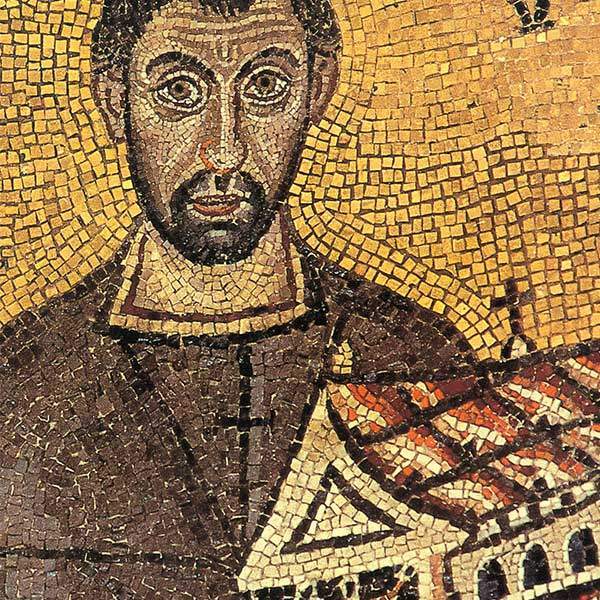 When, in the 6th century, Bishop Euphrasius started on his great (and great not only architecturally) undertaking, he was not starting from nothing. In the area from which his majestic basilica was to arise, and a series of other buildings alongside it, there were already earlier sacred buildings in existence, dating from the 4th century, probably from immediately after 313. When Christianity was still not recognised, the first communities adapted some existing buildings for their services. 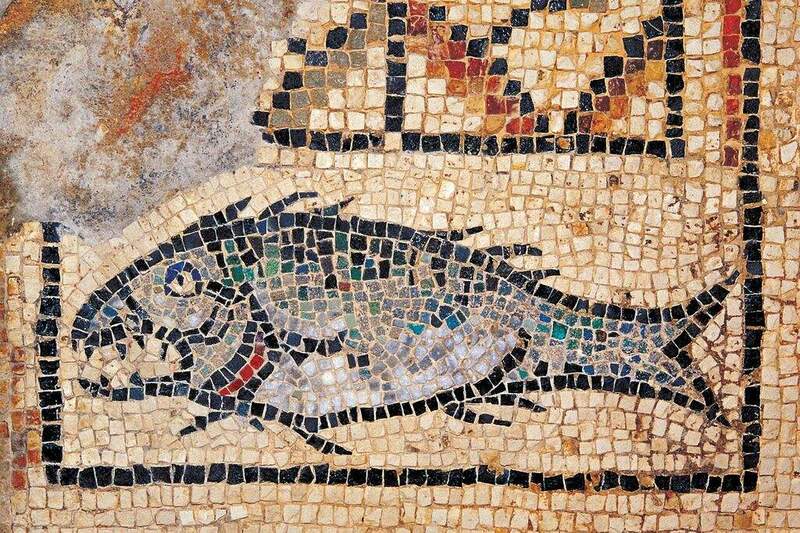 Floor mosaics in which there are motifs of tendrils, meanders and pictures of fish that point clearly to their symbolic significance belong to the first oratory, the remains of which are to be found alongside the Basilica of Euphrasius itself. In the upper part of a square mosaic with a cantharos the names of the donors who had the mosaic made, and the number of feet of area, are written. There are several such examples of names of donors, in the mosaics that have been excavated under the north nave of the Basilica of Euphrasius. From all these floor mosaics and from the inscriptions that have been preserved we are able to follow the phases of the building, adaptations and renovations, in other words, the dynamics of the life of the Christian community in Poreč of the pre-Euphrasian era. From one stone slab with an inscription we learn of the transfer of the body of the saint and martyr of Poreč, St Maurus from the graveyard “outside the town” to the place where “he had been bishop”. This place is the new hall built alongside the earlier oratory, and identical to it, through which a twin basilica, basilicae geminae, came into being. When a new large basilica was built in the 5th century, it developed into the existing sacred buildings. It is a three naved basilica with a rectangular ground plan without an apse; in the eastern part it has a semicircular wall for the priests’ stalls, and like other churches in Istria of the 5th century, it developed under the influence of the architecture of the eastern coast of the Adriatic and of the Near East. The local builders combined these influences with the inheritance from the Early Christian age and from Roman profane architecture. The walls were built of naturally broken stones roughly dressed which needed thick applications of stucco and were reinforced with lesenes. This was the basic inventory that Euphrasius would have encountered in the middle of the 6th century when he arrived in his new see. Below the central window in the apse of his basilica, dominated by the figures of the Madonna and Child flanked by Bishop Euphrasius, Archdeacon Claudius, the saint and martyr Maurus and others, there is a Latin inscription in which the bishop explains the reason for his great architectural enterprise. In translation it runs as follows: Here at first was a shaken and ruined temple in danger of falling down, and it was not strengthened by sure power, it was narrow and was not embellished with gold, and the dilapidated roof was held together only by grace. When the concerned priest Euphrasius, devoted to the faith, saw that his seat was in danger of collapsing under the burden with a holy intention he forestalled the ruination, and to make the ruined building more firm he demolished it, having lain the foundations he raised the summit of the temple.What in these days you see shines in gold (he) embellished, finishing what had been started, and gave it great gifts, calling on Christ’s name he marked the church, rejoicing in the work. This testimony of the bishop’s does not entirely correspond with the truth. 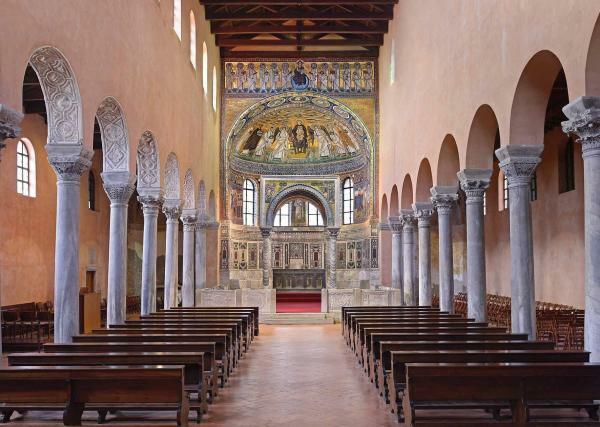 The basilica that met Euphrasius on his arrival was not entirely ruinous or modestly decorated. Parts of its walls and main pillars served for the construction of the new church. As for mosaics, they were not completely wanting in the 5th century basilica. 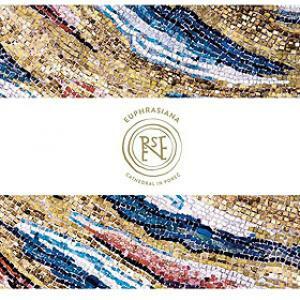 The reasons are more to be found in the taste of the new age and the centre from which Euphrasius came to Poreč. 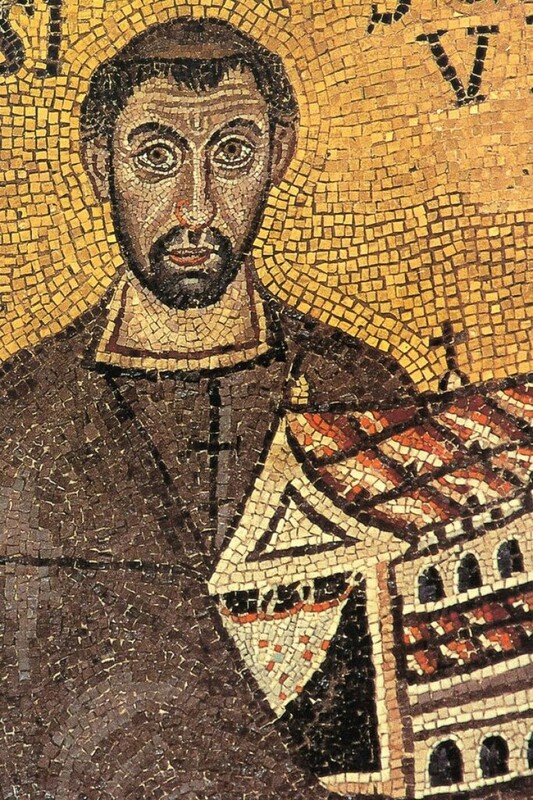 Milan Prelog, the great art historian without whose research and publications our history of the city of Poreč and of Euphrasius’s complex would be much poorer and far less clear, insists on the fact of the external, i.e., Byzantine, effect on local tradition as crucial in understanding Euphrasius’s initiative. For that reason the innovations that were carried out here, the aim of which was to link together the distant stretches of the Mediterranean, place the work of the great bishop of Poreč in a very important place in the history of art. The construction of the basilica, and above all the organisation of the interior space, the sculptural elements and the iconographic programme carried out in the wall mosaics together constitute an exceptionally important moment in the development of western art and the inclusionwithin it of impulses conceived in the eastern part of the disunited Roman Empire. One of these great innovative elements was the eastern part of Euphrasius’s basilica, which ends with three apses; the large one that is polygonally shaped from outside corresponds to the main nave, while the two side naves have their own apses in the form of semicircular scoopings out of the wall mass that is straight outside. This venture meant that for the first time in the West a three naved basilica closed by three apses, that is, with three visual and cult centres, and three separate altars, was formed into a single spatial whole. Euphrasius’s basilica was only the central part of a larger complex formed by a number of buildings constructed mostly at the same time. The building of the bishop’s palace is a larger edifice and has only in parts retained its original appearance. It is located to the north west of the basilica itself, and is linked with its narthex by a narrow corridor. It was a single storey construction with a simple, rectangular ground plan and a great apse. The fine central hall on the first floor, the salutatorium or segretarium had a tribelon (entrance) in front of the apse, preserved only in fragments (a column with a capital and arches with remains of stucco and marble decoration) and was used for the bishop’s non-liturgical reception of both clerics and laity. The entrance into the basilica itself is constituted by the narthex, which was constructed on the site of an earlier street, and the space before the narthex belongs to a fine open atrium with a square basis. Opposite the entrance to the basilica, the baptistery is located. This octagonal building drives from the pre-Euphrasian time, and is dependent on the architecture of the late classical tradition. The structure of the walls and the wooden roof construction are the work of local builders. In the north eastern corner of the basilica there is a memorial chapel the ground plan of which is somewhat different from those of the other buildings in its immediate vicinity. The trefoil ground plan of the chapel, in which reliquaries are kept, has an oval antechamber in front of the entrance. Outside, the three semicircular apses of the chapel gained a polygonal shape; considerable restoration works were done on the whole of the building in the 19th century.Both the atrium and the baptistery, and all the parts of the walls of the basilica, were taken over in large part from the building that Euphrasius found here. However, the conversions, and still more the new organisation of the whole, bear witness to a very precise concept that the bishop used to give shape to his great complex. It is this concept that reveals the spirit of the times and of Euphrasius’s bold vision. We shall find visible signs of the presence of both Euphrasius and the spirit of the East in the rich decoration of the interior of the basilica. The naves share two rows of nine arcades linked at both their eastern and western ends with pilasters on the wall. 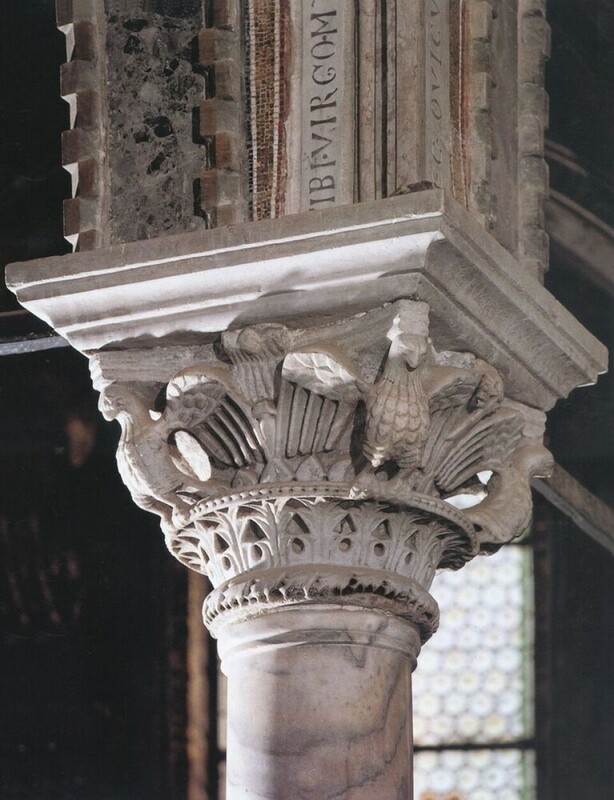 The arcades are made of pillars of grey marble that rest on finely shaped bases and in their upper parts finish in capitals above which are imposts with round medallions in which Euphrasius’s monogram is carved. Quite unambiguously, the capitals indicate the origins of Euphrasius’s aesthetic viewpoints. Whether it is a matter of very individual variations of Corinthian composite columns, or of planes of reversed truncated pyramids opened up by rich perforations that create ornaments like braiding or stylised plants, the refinement of high Byzantine art can always be clearly be gathered from them. To this catalogue of the plastic devices of Euphrasius’s basilica we should add the sequence of marble slabs of the railing decorated with bas reliefs with symbolic representations (crosses, monograms, birds, deer, cantharos, stylised horns). In the arcades on the northern side the stucco work has been preserved; originally, this was painted. To this visual brilliance we should add the incrustations in the lower part of the apse. Pieces of multicoloured marble and mother-of-pearl covering the walls create an imaginative kind of ornamentation. In the apse there are marble stalls for the priests, closed at the sides by marble slabs with reliefs of dolphins, while in the centre of the semicircle rises the bishop’s throne. 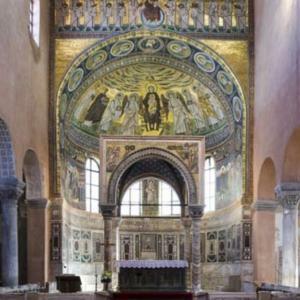 If we pass from space to the wall surfaces of Euphrasius’s basilica, here too we shall find, in the brilliance of the mosaics, supreme artistic values. We shall also find iconographic innovations used for the first time in the west. In Poreč, the Virgin occupies a central place in the apse, which had previously belonged only to Christ. She sits on a throne and on her knee she holds the baby Jesus, dressed in Roman ceremonial clothing, right hand raised for blessing. On each side of Mary there is an angel leading the throngs that have come to hail her. From Mary’s left side come three unnamed martyrs with wreaths in their hands and haloes above their heads. They too are dressed like angels in Roman ceremonial robes. On the other side behind the angels is Saint Maurus, shown in the same way as the previous three martyrs, but with his name written in with the halo. This saint and bishop of Poreč leads an exceptionally interesting group made up of three living people, three contemporaries: Bishop Euphrasius holding a model of his basilica in his hand, Archdeacon Claudius, Euphrasius’s brother, and a boy between them, whom we identify from the legend as the son of the Archdeacon, named, like his uncle, Euphrasius. Of course, it must have required a deal of audacity for the donor, together with two other contemporaries, close relatives at that, to step into the space meant for those much higher in the celestial hierarchy. However, Euphrasius quite clearly was not an ordinary mortal, a rebel who dared to set strict church standards at defiance. The angels and the holy martyrs from the train that surrounds the Madonna on the throne, in spite of their fine Roman clothing, have faces and gestures that are to some extent typical. As against them, the living characters that approach the heavenly throne without haloes are shown in an individual way, as if it were really a matter of portraits. The Virgin, located in the upper part of the apse, is the central point of Euphrasius’s Basilica. The baby Christ sits in her lap. Christ and the Virgin are the central personalities of Christianity. There is in Christian iconography one point where the characters of Mary and Christ, her Son and God, come closest together, inform each other absolutely. This is the Annunciation, the moment at which God enters Mary’s human body. In iconography the Annunciation is based on the Gospel according to St Luke, filled out with the apocryphal works the Protoevangelium of James and the Pseudo-Matthew’s Gospel, and from later times motifs from sermons and mystical literature. The Annunciation can be found in iconography very early on, and is there already in the 4th century in the Roman catacombs, while in the 5th century it developed as an omnipresent type with clearly standardised positions, gestures and expressions. The Virgin is shown in a sitting position on a throne, usually with a distaff and yarn in her hand, and there is an angel walking, clothed in the glory of classical clothing. That is how it is in Poreč as well. However, since it is the year 540, Justinian’s time and the Byzantium spirit that are concerned, the Madonna is dressed in Byzantine clothing, her head partially covered in a veil called a maforion. This veil has its own significance: it is a symbol of virginity and has probably been borrowed from Syrian art. Mary sits on a throne the pillars of which merge with the pillars of the Basilica, the church. This image has its source in the commentaries of St Ambrose who, talking of the Annunciation in Luke, draws attention to the link between, the identification of, Mary and the Church. More precisely, the Church, like Mary in the deed of the Annunciation, is filled with the Holy Spirit. In her left hand Mary holds purple thread, since the angel has found her at work. The fact of surprise is indicated here by the gesture of Mary’s right hand, which she moves towards her slightly inclined head. The attractive figure of the angel, turned in half profile, as prescribed by the times, greets her with his right hand, while in his left he holds a long messenger’s staff. He is dressed in brilliant classical clothing, the folds of which follow the rapid movements of the body. This movement is expressed by the feet which are apart, the right having its toes on the ground. Opposite the Annunciation in the apse of the Euphrasian Basilica is an image of the Visitation. Two slender female figures, Mary in purple and Elizabeth in yellow robes, clearly reveal their pregnancy. Behind Elizabeth is the façade of a building, through the door of which peeps a girlish figure with a hand moved towards her mouth. This gesture, full of charming inquisitiveness, gives an impression of still more dignity and ceremoniousness to the two main figures. Mary and Elizabeth belong to a second hierarchy of figures: they are the chosen ones of heaven, bearing in their bodies the great protagonists who will change the fates of world and time. Between these two main scenes from the life of Mary, in the central part of the apse and in special fields set off by windows are the figures of St Zachary, an angel and St John the Baptist. In the lower part of the arch of triumph there are thirteen round medallions. In the central one is Christ depicted as Agnus Dei, while on each side, six on each, there are images of saints with their names inscribed. 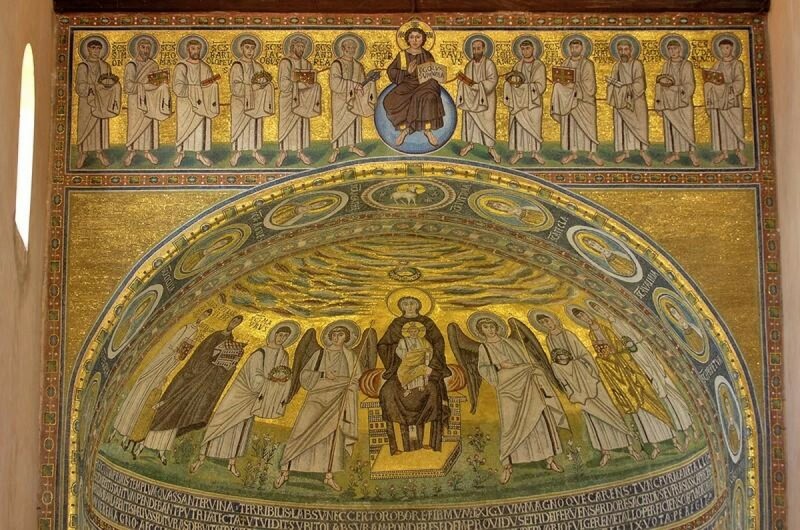 For the final part of the mosaic, on the frontal wall of the apse, is a frieze made up of almost identical figures of the Apostles with Christ in their centre. Christ is depicted as a young king who, sitting on a globe, rules the universe. The Apostles, in a monotone rhythm, symmetrically on each side, frame the central figure of the young ruler. In their hands, covered with mantles, they hold various attributes, and between their round haloes are inscriptions with their names. In the upper zones of the side apses there are also fragments of mosaics that have been preserved with almost identical depictions: a great figure of Christ emerging from stylised clouds placing laurel wreaths on the heads of two martyrs. The mosaics did not cover just the interior of the church, they can also be found outside as well, on the front above the narthex. From the parts that have been preserved it is difficult to gain an impression of the original appearance, since the mosaics in the upper part have almost completely disappeared, and in the lower part were changed during 19th century restoration. The destroyed mosaics on the pediment had a picture of Christ sitting on a globe, below which four stylised heavenly rivers run, there being four apostles on the left. The lower part has two apostles in each field at the edge, while in the two central fields, separated by a window, are seven apocalyptic candlesticks. When after a long period of crisis and fatigue Poreč began to recover for a short time, in the 13th century, this can be felt in the cathedral as well. Seven centuries after Euphrasius, one new masterpiece was placed in his basilica. In 1277 a great marble ciborium was built, ordered by Otto, Bishop of Poreč. The high canopy is placed on four slender pillars that belonged to the previous ciborium with capitals from the 6th century. The new canopy too is covered with mosaics, and on the frontal side it has the same iconographic motif as already exists on the wall of the apse – the Annunciation. The different time, of course, has brought in a number of variations in form. The fact that the figures of Mary and Gabriel are in different spaces, now in triangular sectors above the arch, must have entailed other compositional procedures as well. On the left side is the angel, his arm raised high in greeting, a herald’s staff thrown over his shoulder. He now steps more forcefully, and this is shown by the numerous folds in the robe and the angle of the wings. The space between the angel and Mary, on both sides, is filled with a bent tree. Mary now stands in front of the throne behind which once again buildings go on. The expression of her face, head completely bent in confusion, is followed by the gesture of her right hand, palm opened and raised high. The new time attempts to express psychological states with much more rhetoric. Bishop Otto, in a way, to a lesser extent, was to repeat the process that his great predecessor had carried out much earlier. This was the process through which one set of cultural traces was encouraged to grow into another. The early Byzantine pillars and capitals hold the construction of the new Gothic baldachin covered with mosaics that clearly show that one tradition is ending and another appearing, in which the signs of Byzantium are increasingly atrophied, soon to disappear entirely. As in the middle of the 6th century Euphrasius brought the spirit of Byzantium to Poreč and thus gave the city a clear orientation, political, cultural and artistic, for numbers of centuries to come, so in Otto’s new ciborium we can unambiguously read a new time. 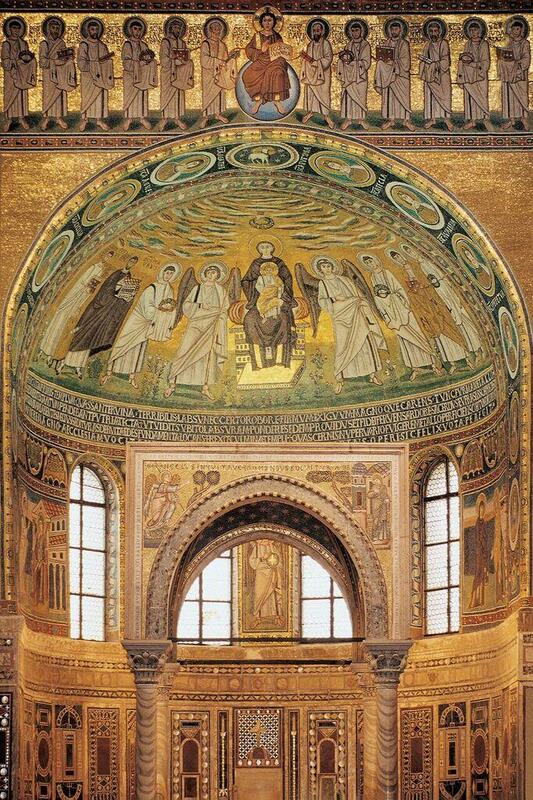 The mosaics and the pointed arches of the ciborium clearly show their Venetian origin. However, they are in a way more advanced than the taste that ruled Venice at the time. More advanced in that they reveal references characteristic of the paleological renewal of painting in Byzantium. 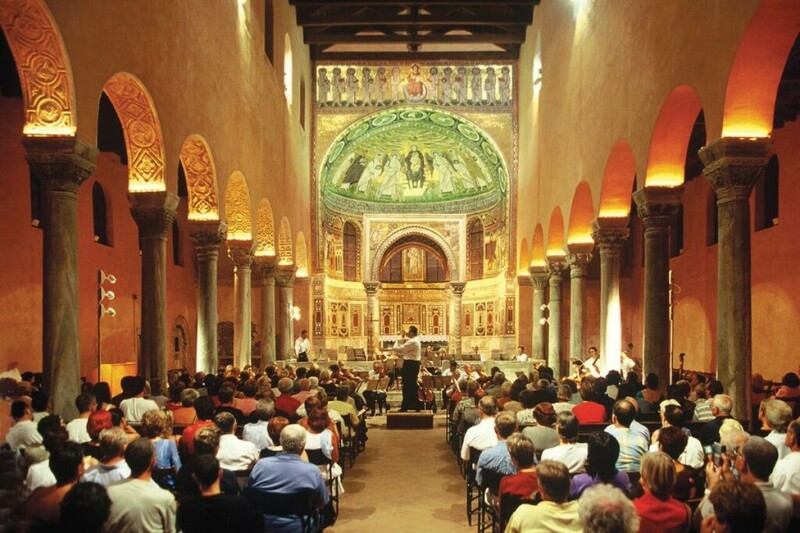 In Poreč thus, East and West once again touch in the sanctuary of the cathedral. However, the touch of Venice is now more decisive. Both Venice and Poreč will now together emerge from the Byzantium circle and turn toward the West. We shall feel this new orientation in all later interventions and additions to the inventory. As in the cathedral, so in the city. It can be felt in the somewhat naive murals of the 15th century, preserved only in fragments, and in the procurement of the Renaissance polyptych of Antonio Vivarini, as well as in a whole series of other works that either came into being in Poreč or were imported for good.